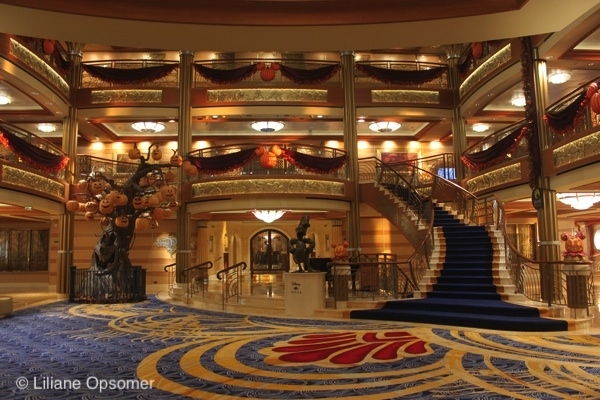 Have you ever dreamed of going on a Disney Cruise? Are you a Walt Disney World and/or Disneyland Fan and wanted to know what a Disney Cruise would be like? 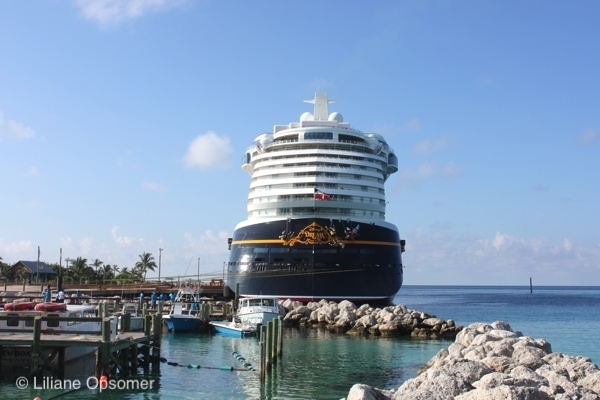 Has your family been on other Cruise Lines before and thought about a Disney Cruise? If a Disney Cruise has peeked your interest in any way, then the Unofficial Guide, Disney Cruise Line 2019 is for YOU! 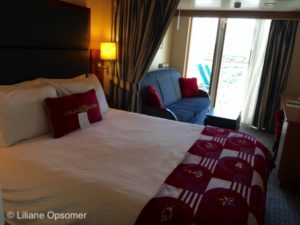 I have had the extreme pleasure of reviewing “the Unofficial Guide, Disney Cruise 2017” and was so excited to be able to review this year’s Guide. To spin a different angle for this review, I present you with A-Z (26) reasons why you need this GUIDE! Read until “Z” and then enter our GIVEAWAY for your very own copy of the Unofficial Guide. The authors of this Guide are Erin Foster, Len Testa and editor Ritchey Halphen. 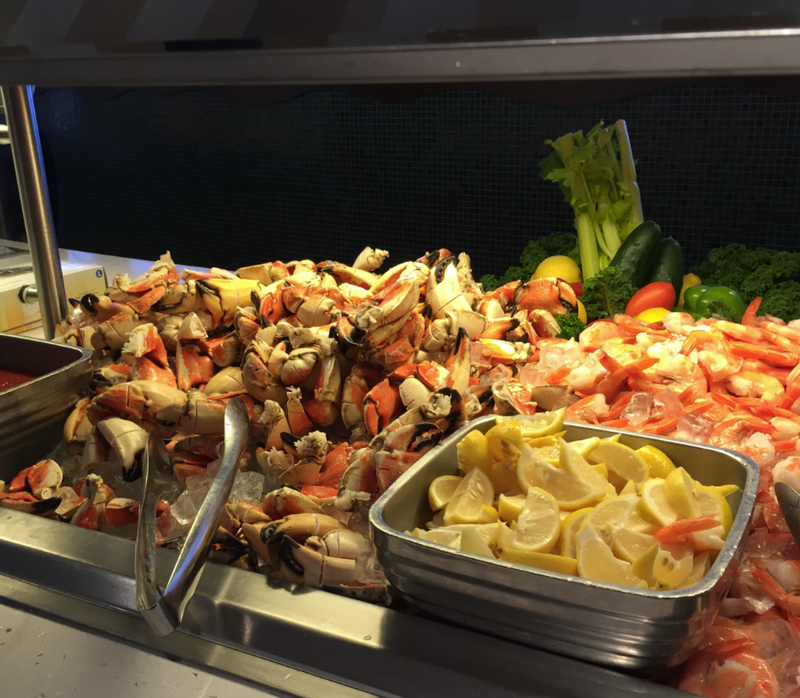 With special tips throughout the guide from Scott Sanders of the Disney Cruise Blog as well as other special expert input from Matt Hochberg and other esteemed guests. They know practically everything you need to know about a Disney Cruise. And you won’t get bored reading their tips (see “H” for humor below). They are also seasoned travellers to Walt Disney World and Disneyland, in fact, Erin Foster was a member of the coveted Disney Parks Moms Panel. Len Testa, the statistical genius who created the famous Touring Plans is a wealth of knowledge and although you may envy his job, along with his co-authors of all the Unofficial Guides, they go to great lengths to find the best information for their readers (including staying at a shady motel for $50 a night in past years near Walt Disney World to let you know if it is worth, note: it’s NOT). 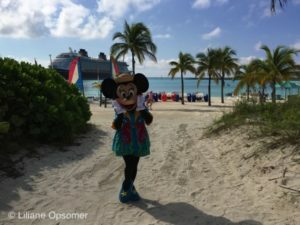 I was first introduced to Scott Sanders of The Disney Cruise Line Blog when I reviewed the Unofficial Guide, Disney Cruise Line 2017 and have been following him on Twitter and Instagram ever since. He KNOWs cruising and his tips throughout the guide are extremely helpful. And a shout out to Liliane Opsomer, Marketing & Public Relations of the Unofficial Guide, she is like the glue that connects us “regular folks” to these respected authors. A very special thanks to Liliane for all of her hard work! In this guide, you are informed of the 3 ways to book a Disney Cruise as well as requirements to book. They also give tips on ways to save money by suggesting the best times to book. This guide has a great section to PREPARE for your cruise. And when you are ready to Board, the authors go into detail about the Boarding process at the various ports and what you should expect. Castaway Cay is Disney Cruise Line’s private island. You will find information about this tropical oasis throughout the guide and in 3 specific sections. A whole section is dedicated to talking about the Island including what to bring, the authors’ favorite stuff on the Island and places to relax. There is also a map of the island. Castaway Cay is also covered in two other parts in the Port Adventure Sections where they tell you a bit of the history of the island, what and where to eat as well as what they suggest to get as a souvenir (you’ll be surprised!). They explain why this Island has the best valued “shore excursion” that “DCL has to offer” including which excursion they feel is the most rewarding! AND there is no tendering to the island! YAY! Personal note: tendering is a bit of a hassle about other privately owned islands of other Cruise Lines. Although the PORTS/PORT Adventure sections is my absolute favorite section in the Unofficial Guide, Disney Cruise Line (see “P” below), I have to say, my FAVOURITE sections of all the Unofficial Guides combined is the DINING sections! The authors of this guide as well as all the authors of the other Unofficial Guides are MAJOR Foodies! You will get hungry just reading the Dining section from all of their books. They rate each restaurant, give the hours of operation as well as provide general food offerings you would expect of EACH Dining Establishment on each of the ships, whether it is a Quick Service, a snack bar, a BAR as well as the full service restaurants. They also explain the innovative “Rotational Dining” that the Disney Cruise Line created. You will find out things like: where you would get something akin to frozen pizza, which restaurant has the highest-rated main dining room on any of the four ships, where they serve coffee in which you will question your will to live, the prettiest dining room and where you can get the most delicious carrots you have ever tasted which is also the restaurant they say is 1000% worth it. They also go into wonderful detail about the theme and décor of each eatery. Knowing that the Walt Disney Company is at the top of their game for Entertaining, there is a lot of entertainment to be found on the a DCL cruise. From nightly Live Theater shows to Feature Films including NEW Releases, Sports Events coverage and Themed and Holiday events. They explain and rate each live, musical type shows seen on each ship, which shows are a must, a musical you will be WOW’d and which shows are better to miss and do something else. They suggest that if the show is not particularly interesting to you, the technological aspects of the shows are remarkable. There are live performances too which some, in the authors’ opinions, are less than mediocre and they tell you to save money from buying popcorn when watching one of the DCL movies and eat something else for free. The authors also describe the different themed events happening on each ship, which holidays are celebrated and how the DCL is one of the BEST places to celebrate Halloween. Best Halloween Celebration on board a Disney Cruise. This guide explains each of the 4 DCL ships, Disney Magic, Disney Wonder, Disney Dream and Disney Fantasy. You will read which year each ship was built, which ship went into dry dock and upgraded their amenities, the capacity of passengers on each ship as well as the number of crew members and which ships are larger than the others. They give a lovely description of the décor of the ships, which two are Art Deco and which two are Art Noveau (they explain the two historical design styles as well). They tell you which ship has the AquaDunk and which ships have the AquaDuck, what restaurants and bars you would find in each ship and how they differ. They also mention which ships have the better spa and read which ship they recommend for certain guests’ preferences. They also provide Deck Plans of all 4 ships. Disney is the ultimate best at Guest Service relations. They put the “GUEST” in “Be Our Guest” which the authors mention that you can hear this song on repeat throughout the ships. In this guide they will direct you to how you can contact Disney with issues you may have and how Guest Services work on the ships. There doesn’t appear to be any fun in reading a text book guide of about 450 pages (if you read the Unofficial Guide, Walt Disney World, it’s over 800 pages), so how do the Unofficial Guides keep you interested without falling asleep… HUMOR! Starting from page 420 of the 2019 DCL guide, they include the Itineraries Index including NEW itineraries and changes. They include EVERY sailing for all the Disney Cruise Line ships for 2019 which shows a map for the Itineraries and each port they visit (great for people who need a visual guide of what to expect). So you can start planning which ship you would like to be on in 2019! (they also include some early 2020 sail dates). See “P” – PORTS below. Personal note: this is such a great section to dream about which potential DCL vacations you could take this year! You would think a Disney Cruise would cater mostly to families with kids, you are right, it does! But did you know you can enjoy a Disney Cruise as a Solo Traveler or with just Adults too? There are Adult only restaurants, bars, nightclubs and areas for Solo cruisers or just adults to enjoy. And I learned from the Unofficial Guide, Disney Cruise Line 2017 that DCL is probably the safest of all the Cruise Lines for female solo travelers. Len Testa does mention a scary situation of being a solo traveler on a shore excursion (Port Adventure, see “P” below), and this guide tells you how you can avoid this. And even if your child isn’t interested in the Youth Clubs (see “Y” below), your children will still have a great time with the many activities on board. This guide also explains guidelines to room configurations with families, what is allowed and what is not. How you can bring a child who is not part of the immediate family and which activities as well as Ports (see “P” below) children will enjoy or will find really boring. It is Disney and there is a family friendly, “squeaky-clean” feel about DCL. 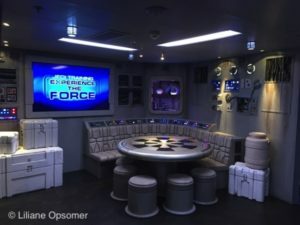 The authors mention that it won’t be a “party barge” ** like other Cruise Lines, The games and humour on DCL will generally be family friendly as well as Entertainment which would help ease some parent’s minds. *Personal Note: our family have cruised on other Cruise Lines and although we have had great experiences on other Cruise Lines, I find that many cruisers complain about children on the forums and Social Media pages of those Cruise Lines. **Personal Note: this guide mentions how upon entering each ship on Embarkation day, they introduce each family and Cast Members clap for the party to welcome them in. On a non-Disney Cruise Ship my family went on once, we entered into a huge room with the DJ blasting “PUSH IT”! WOOT! There is self service Laundry Facilities on all DCL ships. The authors tell you where they are located on each ship, how much it cost and which particular voyage you could expect to be like the Hunger Games. DCL also has full service Laundry as well which they explain briefly about. Personal note: My family was on a non-Disney Cruise ship and I assumed all Cruise ships had self service laundry. I found out the hard way when we first boarded the ship that they don’t, we ended up having to pay a lot more for full service. So it’s always good to know before you go! This guide will explain the different methods of payment to pay for your cruise, how to pay for services while on your cruise, which currency is used in all the Ports (see “P” below for PORTS) and different ways you can save money. Although DCL does not have a casino like other Cruise Ships, they do tell you which Ports do have Casinos and the one game you can play on the DCL ships which you can make money, but cautions that you can get hooked! The Personal Navigator helps you navigate around the ship. The Unofficial Guide tells what you all the important information of daily activities listed. There is also an APP which the Unofficial Guide explains how to use, how useful it is and how helpful it is including the texting function to stay in touch with members of your party. They advise you to download the app before your cruise! With most of the DCL ships embarking from Port Canaveral, Orlando, Florida is the most popular place to stay before and after your DCL cruise vacation. I learned from this guide that you can also stay in Orlando and then drive for 2 hours to the Miami Port too! This guide covers what is the best way to get to the ship on Embarkation day, how many days they suggest you should arrive before, what mode of transportation is best – a popular choice they mention is cute but not the price and how to combine a Land & Sea vacation (see “V” below). The authors talk about some of the places to stay including closer to Port Canaveral in Cocoa Beach, however if you are going to stay in Orlando and possibly do a Land & Sea vacation, I would suggest getting their book, the Unofficial Guide to Walt Disney World. They list almost EVERY hotel in Orlando with ratings, price range, size of hotel etc. inside Walt Disney World Resort and surrounding areas. I mentioned in my review of the Unofficial Guide Disney Cruise Line 2017 that I wasn’t interested in the PORTS section at first. I thought it would be a boring explanation of each Port Disney Cruise Line visits, like a standard Travel guide that tells you what you are going to see in certain areas. Boy was I wrong. It was my favorite section of the whole guide. So when I received this copy of the 2019 edition, the PORTs section was the first thing I turned to! This guide explains each Port DCL will visit in 2019 as well as Hawaii and other PORTS in early 2020. What I love about this section is how they explain and break it down into such wonderful detail, knowing that they actual experienced each PORT. They display the Pros and Cons of each itinerary, for example: where kids might not be that keen on seeing lighthouses and how you relieve the first world problem of “Caribbean-cruise fatigue syndrome”. I love how they briefly touch on the historical aspect of each Port, including the original inhabitants/Indigenous peoples of each area, Colonialist take overs of the Ports leading to multi-cultural shifts and languages spoken of each Port. They tell you which currency is used, what the weather would most likely be like when DCL visits and Highlights of the Ports. Highlight examples include: where is the best place to go whale watching, the place where author Erin Foster’s daughter wants to move to, where you can have a fun escape room experience if you have a macabre sense of humour, where SEA TURTLES would delight your kids and which city is author Len Testa’s favorite. As I mentioned in part “D” – Dining, above, the authors are huge Foodies as well. They explain the delicacies and dishes to try unique to each City/Port like: to look for a fried-fish sandwich served on raisin bread which is surprisingly good, a place that has a much “classier” take on the McMuffin, which fish pudding tastes better than it sounds, where to get their favorite cookies in the universe and so many more delicious as well as some adventurous suggestions. For each PORT, they also have a “What to Buy” section, suggested souvenirs that are unique to that PORT. There is a whole section on shore excursions or “PORT ADVENTURES” as DCL calls it. They explain the benefits and disadvantages of booking a DCL Shore Excursion compared to an Independent company. AND if you are a fan of the Unofficial Guide’s “Touring Plans” either on their app or their tear out plans in the back of their guides, you will be happy to know that they include “Walking Tours” of many of the Ports. They talk about Adventures by Disney and River Cruising which I would never have thought would be a fit for my family but after reading this particular edition, I really am interested in one! With DCL specializing in Family Vacations and entertaining children, you would think it would be one big loud room like the Sunnyside Nursery area that Lotso tried to lock the toys in, in Toy Story 3. Well the authors seem to cherish their peace and quiet very much and they will tell you the quiet places you can enjoy on each ship. They talk about the Quiet Cove Pool, where to have a quiet meal, where you can probably sit and do a whole crossword section of the NY Times, the quietest place on Castaway Cay Island and even which spa area of a particular ship you should avoid because of pounding from above. As mentioned, there are a lot of activities provided by DCL for guests. The Unofficial Guide mentions how small the pools are, the difference between AquaDunk and AquaDuck as well as the water play areas for younger children. There are Sports and Fitness centers to keep you active as well as fun games. They do note that DCL ships do not have a games room or library like other Cruise Lines do. The authors talk about how wonderful the spas are and what would be the best value for your money to spend the day in and on page 258, they list what they have done during “A Day at Sea” my favorite of their list is, “Learn to Mix Drinks, Drink the Drinks we mixed”. Similar to their extensive knowledge of practically every room (each room in each section) of ALL Disney Resorts, you will get the same detailed information in this guide about all DCL staterooms. This guide provides the floor plans of each Stateroom category of each ship, the size of each staterooms, what to expect, what you shouldn’t expect, a great list of what you need to consider before booking a category of stateroom, which Verandah Staterooms have an unobstructed view and which stateroom is “more popular than a Dole Whip on a sweltering day…” , these are just some examples in the guide’s ‘Stateroom” section. Photo of one of the Staterooms on the Disney Cruise Line. I’m not talking about the kind of touching author Erin Foster doesn’t like (you would have to read this guide to find out). I must say that the 2019 edition in particular, has many touching moments that got me a bit emotional. When reading this guide, one gets the sense that the authors love their job and genuinely care about the Cast Members they meet and the Ports they visit. Since 2017, many of the Caribbean Ports have unfortunately been hard hit by Hurricanes. They mention which Ports are rebuilding their economy through tourism and encourage readers to visit and help their rebuilding efforts. I am continually touched also by how much they respect Cast Members who work for the Disney Cruise Line as well as the Disney Theme Parks. With the Disney Cruise Line in particular, it was great to read about their positive interactions with Cast Members, how they know many by name and gives readers a general guide on how much to tip (Gratuities) because they understand just how hard the Cast Members work. They also encourage readers to fill out the Cast Compliment Cards to hopefully further advance a deserving Cast Member’s career. Why are these guides called “Unofficial”? Because they are not approved or sponsored or dictated by the Official Disney Cruise Line. Their opinions and suggestions are based on their own experience – all to help US, their readers. They give suggestions we can save money, what is recommended to see and experience, and what is best to avoid in order to have the perfect Vacation. They know a Disney Cruise Line vacation is quite the investment and they want to ensure our investment is worth it! Personal Note: I like Scott Sanders tip about relaxing on your cruise vacation and not having to think you have to do it all. Since the authors are also experts of Walt Disney World, they often get asked the question, which is a better vacation, Disney World vs. Disney Cruise Line? In Part 2 they present 20 factors for you to consider on how to make this decision. They also give a brief example on price comparisons between the two different types of vacation. If you are considering a Land & Sea vacation where you can combine a Disney Theme Park Vacation with your DCL vacation, (Walt Disney World, Disneyland, Disneyland Paris or Aulani – Hawaii) they mention this in the guide with tips and which itineraries would work best. Throughout the guide, they give suggestions on what to bring on your Disney Cruise. They include what the weather would be like in each Port so you are prepared to bring the appropriate clothing for the particular Itinerary you choose. They give the rules on what is acceptable at certain restaurants on board and what attire will be turned away. They joke how sometimes you may question some cruisers’ sartorial styles (HA!). They also include which Ports you should dress more conservatively, especially when visiting certain landmarks and where you don’t have to wear any clothes at all. I cheated here and used “X” for Exceptional and Extraordinary. So who are “Extraordinary People” that have Exceptional Service on a Disney Cruise? This topic is personal to me as I believe my 4 year old is extraordinary. He has severe anaphylactic food allergies and has been in the hospital many times. What I love about the Walt Disney World Resort and Theme Parks is how accommodating they are to his allergies. He can eat at Walt Disney World and feel like a “normal” kid”. Our family has had great experiences with other Cruise Lines accommodating his allergies yet I heard Disney Cruise Line is the Extraordinary Standard in Food Allergy Service. This Guide includes other examples of Exceptional Service for Extraordinary People as well (they title it “with varied circumstances”). I believe everyone experiencing any type of circumstances where they face many obstacles in their every day lives, are extraordinary. In Part 5, they feature Alison Singer, president of the Autism Science Foundation, where she talks about her family’s positive experience with the Disney Cruise Line with her daughter Jodie, who has severe autism. Also, throughout the Guide, they note any issues that yourself or your family member may have with any type of sensory issues that may occur with activities, shows etc. and how to prepare for it. They mention services for guests with disabilities with a beautiful experience shared by a lovely reader. They also talk about service animals as well as services for sight and hearing-impaired guests. The authors also give tips on traveling with Medications. The Youth Clubs are where your children will most likely spend most of their time (unless your child doesn’t want to, there are still plenty of activities to enjoy with family on board). The authors say that the clubs are so well themed, that adults touring the clubs (on open house days only) may not want to leave. They explain the different age groups for each club, at which age the Counsellors start to treat your child like one of them, the different games and activities they do, how your teen might forget you exist, why the teen space is the COOLEST place on the ships and you can also pay for nursery services for toddlers and babies at certain ages allowable on board. I really liked reading from their Guest Author, Kieran, who is a young cruiser and gives her take on why the Youth Clubs are her favorite thing on the Disney Cruise Line. Star Wars Themed area in the Youth Clubs of the Disney Cruise Line. The Unofficial Guide mentions the not so fun stuff as well, like the ZIKA virus and how DCL handles this as well as other viruses and/or diseases with travel advisories for each port. Mentioned in “T” above, the Unofficial Guide, Disney Cruise Line talks about which Port was affected by Hurricanes as well as other natural disasters. They also tell you which Port has travel warnings for potential danger to vacationers. DCL does a great job at trying their best to protect their Customers which is explained in this guide. So there you have it, 26 reasons why you NEED this guide! 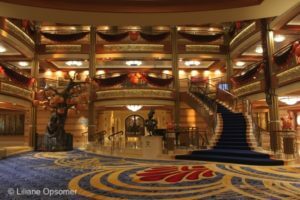 Whether you are going on a Disney Cruise, want to go on a Disney Cruise or dreaming of a Disney Cruise, this Guide is for you. 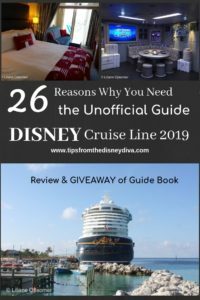 Enter our giveaway to win your very own the Unofficial Guide to Disney Cruise Line 2019! GIVEAWAY: Would you like to win a copy of this Unofficial Guide for yourself?? Great news, we’ve partnered with the Unofficial Guides to offer one lucky Tips from the Disney Divas and Devos reader a copy of their own Unofficial Guide to Disney Cruise Line 2019! First, you will need to sign up for the Unofficial Guide newsletter here. You will use the Rafflecopter link below to confirm your entries – additional entries are available, but the two mentioned above are mandatory to enter. You will need to “LIKE” each of the Facebook entries for those to count. All entries will be verified. The winner will be contacted by email and have 48 hours to respond. The contest ends on Wednesday, January 30. GOOD LUCK! **Disclaimer: All photo’s were provided to me by Liliane Opsomer from The Unofficial Guide series, if you want to share any of these photo’s, please credit the photographer, Liliane Opsomer. Lilliane Opsomer from The Unofficial Guide series provided me a complimentary copy of The Unofficial Guide Universal Orlando 2019 to review. 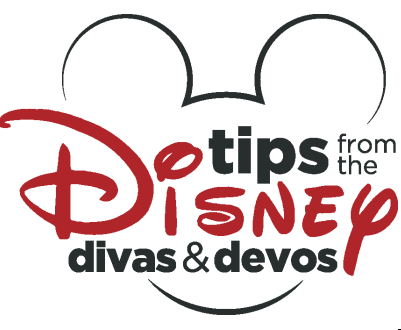 She graciously allowed Tips from the Disney Divas and Devos to give away another Unofficial Guide book to our readers. I received no other compensation for my review, and opinions are completely my own. The Unofficial Guide Disney Cruise Line 2018 Review and GIVEAWAY!!!!!!!!!! Born and raised in Canada. Loving Disney has meant a lifetime of hope, dreams, happiness, learning values and kindness. It is the magic across all boundaries and an adoration I can share with my loving family, my friends and... with YOU! Spreading the magic through writing is what keeps this incredible circle growing and building positively, that is the Disney Dream.